Religion of Soaky Drip; Dewey Drip's uncle; "a born tank"
First Appearance: Police Comics #4 (Nov. 1941): "But Dewey- What makes you think you'll do well in the Tank Corps?" 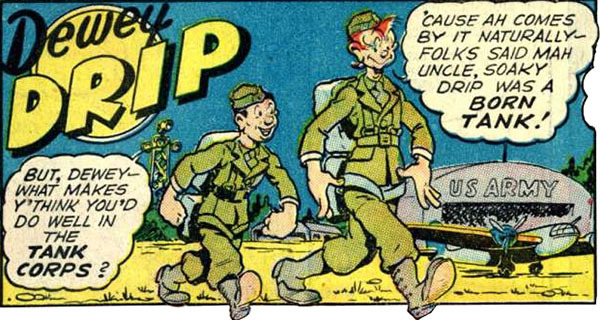 Note: Dewey Drip's uncle; "a born tank"
Not long after Deep South hillbilly Dewey Drip joined the U.S. Army, he was talking with a friend of his, a fellow new recruit soldier. Dewey's friend asked him: "But, Dewey-- What makes y'think you'd do well in the tank corps?" Dewey answered: "'Cause ah comes by it naturally-- folks said mah uncle, Soaky Drip was a born tank!" What people meant when they called Soaky Drip a "born tank" is not completely clear in the context of this 1-page comic story. But the most likely meaning would seem to be that Soaky is a large, physically imposing person. This seems to be the most common meaning of the phrase "a born tank." Nothing else is known about Dewey's uncle Soaky Drip. But presumably Soaky is a true hillbilly like his brother (Dewey's father).